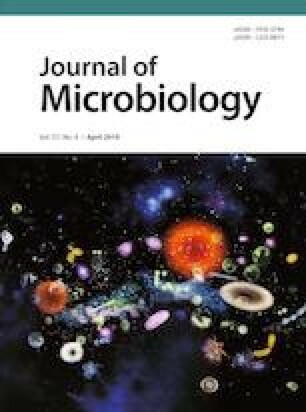 A Gram-stain-negative, non-spore-forming, facultative, rod-shaped bacterium (designated LA-28T) was isolated from a sludge sample from a wastewater treatment plant in Hanam city, Republic of Korea. On the basis of 16S rRNA gene sequencing, strain LA-28T clustered with species of the genus Mesorhizobium and appeared closely related to M. jarvisii LMG 28313T (96.8%), M. waimense ICMP 19557T (96.7%), and M. huakuii LMG 14107T (96.7%). Growth occurs at 18–40°C on R2A medium in the presence of 1–4% NaCl (w/v) and at pH 6–8. The DNA G+C content was 61.2 mol%, and the predominant quinone was ubiquinone-10 (Q-10). The major cellular fatty acids (> 5%) were C16:0, C19:0ω8c cyclo, C18:1ω7c 11-methyl, and C18:1ω7c and/or C18:1ω6c (summed feature 8). Major polar lipids were phosphatidylglycerol (PG), phosphatidylethanolamine (PE), phosphatidyl-N-methylethanolamine (PME), and phosphatidylcholine (PC). Physiological and biochemical characteristics indicated that strain LA-28T represents a novel species of the genus Mesorhizobium, for which the name Mesorhizobium denitrificans sp. nov. is proposed. The type strain is LA-28T (= KACC 19675T = LMG 30806T). Supplemental material for this article may be found at https://doi.org/www.springerlink.com/content/120956. Supplementary material is available for this article at https://doi.org/10.1007/s12275-019-8590-0 and is accessible for authorized users. Supplementary material, approximately 83.6 KB.